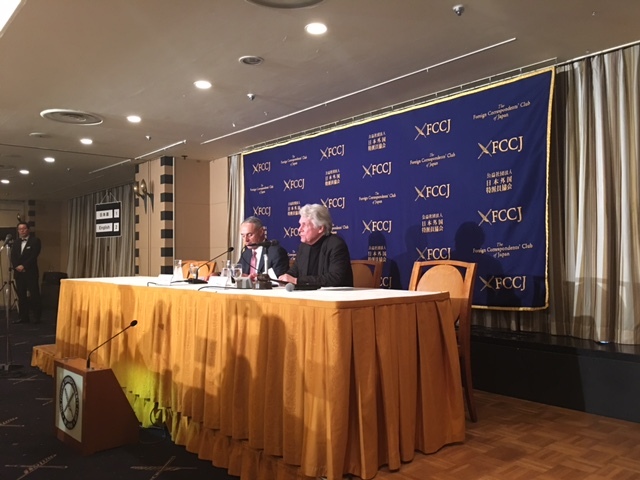 MLB commissioner Rob Manfred speaks at the Foreign Correspondents' Club of Japan on Tuesday. Major League Baseball commissioner Rob Manfred said the league remains committed to the World Baseball Classic, and later watched Houston Astros outfielder Norichika Aoki compete for Samurai JapanHe sounded less optimistic about the chance MLB will send any of its stars back to Tokyo in four years for the 2020 Olympics“There have not been any substantive discussions with the baseball and softball confederation about participation of major league players in the 2020 Olympics,” Manfred said at the Foreign Correspondents’ Club of Japan on Tuesday. “I’m sure that those conversations will take place. We have not even been informed about what exactly the format of the event is going to be, how many days would be involved and whatnot“Even in the absence of that information, the skepticism that you’ve heard from some relates to, no matter how you put the event together there would be a significant amount of major league players who would be away from their teams. It would alter the competition in our everyday game. I do not believe our owners would support some sort of a break in our season. Continuity is really important to our competition.The commissioner, however, said he was waiting for more information“I am more than prepared to hear what the event is going to look like, describe to our owners what our options are with respect to participation in that type of event, and we’ll make a decision from there,” he saidThe commissioner was in Japan on Tuesday to attend the WBC’s Pool B opener between Japan and Cuba at Tokyo Dome. He was in Seoul for the tournament opener (Israel and South Korea) and also plans to attend a game in Miami“We believe this event is the premier international baseball event and will continue to grow in popularity over the years,” Manfred said. “It is a great event because it allows the greatest baseball players in the world to compete against each other and allows them to have that competition with the extra honor of representing their country.He said he was miffed by rumors this year’s WBC could be the last edition“I really don’t know where that report came from,” he saidManfred said the WBC’s popularity around the world is probably highest in Japan. The commissioner added that in places such as the U.S., it would take time to reach a similar level“I think if you look at international competitions, there’s a tendency to look at them as they exist today,” Manfred said. “After baseball, the sport I pay the most attention to is golf. When you think about the Ryder Cup and the amazing popularity and interest that it drives today, that took time.Manfred also acknowledged some the challenges of the WBC, such as the timing of the event. He expressed hope that as the tournament grows, and there is a better understanding of how it feeds into the growth and development of the game internationally, that common ground can be struck with team executives still apprehensive about their best players competing“I know we have tremendous ownership support for this event,” Manfred said. “By that, I mean literally 30-0 support. Where we have a problem is, our operating people, the general managers, get paid to do one thing. They see their job as putting the most competitive Major League Baseball team that they can out on the field. It’s at that level that we have occasionally seen some resistance.Domestically, the commissioner also spoke about meeting with U.S. President Donald Trump and the impact his administration may have on the league“I think every president has some impact on a business like ours,” Manfred said. “To date, we have not seen anything from the Trump administration that has had a material impact on our operations. Which is interesting given the diversity of our workforce. We really have not seen any changes to date.Manfred said he didn’t expect Trump’s immigration policy to have an effect on MLB“We got our visas this year in exactly the same way that we have for many years,” he said. “We believe going forward that we’re going to continue to do business the way we have in the past and we’ve seen nothing from the administration that would suggest to the contrary.Our principle concern with respect to Latin America, and Mexico in particular, is the ability of players to come and go in order to play Major League Baseball. We have not seen any changes that have materially impacted that so far in 2017.Manfred is also confident in the effectiveness of the posting system, saying it benefited both MLB and NPB. He also spoke about how Shohei Otani would come under MLB’s new intentional salary restrictions should he move to MLB before turning 25 and spending six seasons in a major foreign league. Otani is 22“Prior to being elected (as commissioner) there was only one thing I was good at,” Manfred said. “I was a pretty good labor lawyer. Sort of rule 1 in labor negotiations is individually driven exceptions with a union get you into a lot of trouble. As appealing as Mr. Otani is as a player, it’s more important when you’re doing a collective bargaining agreement to keep your eyes on what the rule should be for all players and not get distracted by the appeal of anyone.